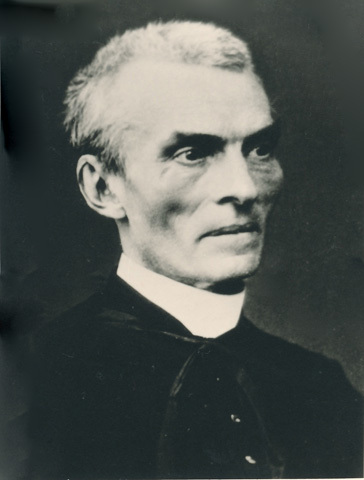 Despite his period of estrangement from the Congregation, de Cuers was elected superior-general within a week of Eymard’s death. In contrast, there was no unholy haste as far as Eymard’s Constitutions were concerned. Twenty-seven years passed before the Constitutions were fully accepted by the Congregation and approved by the Holy See. Guitton points to an ‘identity crisis’ in the immediate aftermath of Eymard’s death when the Founder’s works and teaching were being challenged and debated by his followers. Men were deeply divided over the extent of the apostolic or contemplative character of the Congregation. The crisis was related to the evolution in Eymard’s spirituality towards the end of his life, when he was coming to view adoration in terms of a complex personal transformation in the imitation of Christ (the ‘gift of self’) in contrast to the more limited concept of a cult of perpetual ‘service’ or duty to the eucharistic King ‘statically’ localized in the Blessed Sacrament. The crisis also owed much to de Cuers’ succession as superior-general, with his preference for a more contemplative, monastic life of adoration. Another important factor was the propagation of Eymard’s writings and teachings by Albert Tesnière (1847–1909). Before his ordination as a priest of the Blessed Sacrament Congregation in 1871, Tesnière had written a biography of Eymard which promoted the founder’s ‘saintly’ characteristics. He also began to publish many of Eymard’s writings and sermon notes in the series La Divine Eucharistie. These writings were produced in various editions under Eymard’s name. Unfortunately, the border between Eymard’s thought and Tesnière’s contributions became blurred, and this was not fully appreciated until recent times. In a detailed study of Eymard’s ‘Writings’ in 1999, Donald Cave demonstrated that Tesnière took excessive liberties with his source material, so much so that the evolution of Eymard’s thought was not simply ‘incorrectly expressed’ but was also ‘radically deformed’. In Cave’s analysis, Tesnière emerges as an unfaithful editor, who destroyed certain documents, suppressed and rewrote others, and corrected and embellished Eymard to create an orthodox or ‘respectable’ image he thought was appropriate for the times, irrespective of its authenticity. Eymard’s spirituality had significantly broadened and deepened during his own lifetime, yet Tesnière emphasized that piety, duty, and devotion to the ‘real presence’ were the key elements of Eymard’s thought. The ultimate effect, as Cave has argued, was to restrain awareness of Eymard at the simplistic, rigid level of eucharistic theology originally promoted by de Cuers. This outcome had profound implications for the Congregation’s later efforts to find and follow its founder’s true path. Guitton observes the ‘cult aspect’ of solemn eucharistic adoration assuming ‘an increasingly striking importance’ in the decades immediately following Eymard’s death. An official study of Eymard’s spirituality in the 1950s, some years before the Second Vatican Council, concluded that Eymard had envisaged a ‘mixed life’ of both contemplation and action. Yet, as late as 1981, some Congregation members remained adamant that Eymard’s concept of eucharistic life had stressed the primacy of contemplation and that such a life was essentially the ‘service of adoration’. So strong was de Cuers’ influence after Eymard’s death that a general chapter in 1877 debated whether de Cuers should be credited as a ‘co-founder’ with Eymard. The majority accepted that the title ‘co-founder’ was inappropriate because the pope had approved Eymard’s model for the Congregation and, despite de Cuers’ personal ideas about a more contemplative life, even under his administration the Eymard blueprint of a mixed life was essentially followed. There was still uncertainty about the true spirit of the Founder that had developed towards the end of his life. Further instability resulted from financial difficulties, a bitter leadership dispute, and the expulsion of religious orders from France in 1880 under the decree of Jules Ferry, which effectively suppressed most of the Congregation’s houses in that country. During the 1880s the Congregation flirted with the idea of affiliation with the Benedictine Order. This more austere version of enclosed monastic life was eventually rejected as contrary to Eymard’s thinking. Opinion was often divided. The experience of persecution in France suggested that international expansion was a safeguard for preserving the spiritual and material heritage of the Congregation. A General House was opened at San Claudio in Rome in 1882, and in 1890 the first foundation outside Europe was established at Montreal, in the province of Quebec, Canada. By this time there were about sixty religious in the entire Congregation, only ten more than at Eymard’s death, which is a measure of the lack of progress made in the 1870s and 1880s. From Canada, the Congregation became established in the United States, opening in 1900 at St Jean Baptiste Church, New York City. Approval of the reformulated Constitutions by the Holy See in 1895 provided a more settled basis for expansion. Additional communities were soon established in Austria (1897), Italy (1900), Holland (1902), Argentina (1903), and later in Spain and Chile (1908), Brazil (1926) and Uruguay (1927). With steady international growth following the anti-clerical repression in France, the Blessed Sacrament Congregation became known throughout much of the Catholic world.